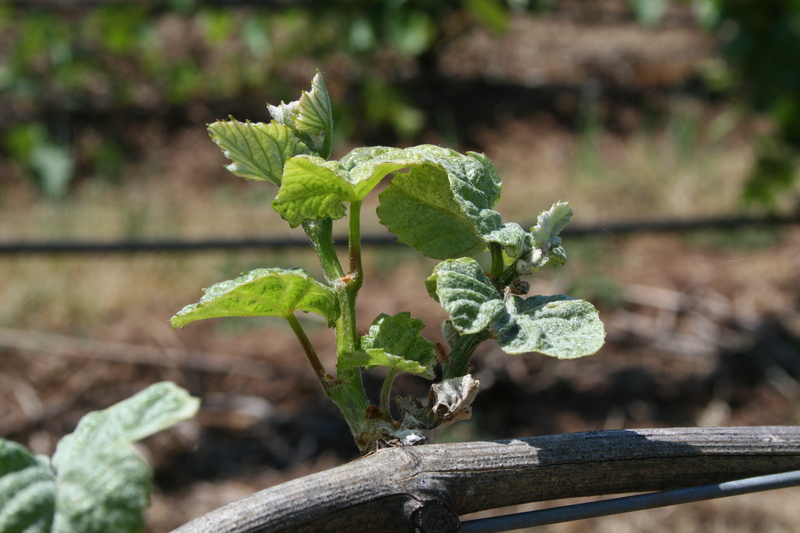 Shoots in early spring can be severely stunted by grape rust mite. These shoots have significant pubescence (plant hairs), deformed leaves, and some leaves may turn necrotic and fall off. Photo courtesy of Patty Skinkis, OSU. Shoots infested with very high populations of rust mites can be severely stunted and look almost burned in appearance. The two shoots at this node had hundreds of rusts mites present per shoot. There may be shoots that appear normal on the same vine, as shown in the shoots to the left and right of the damaged shoots. Rust mite feeding on leaves can cause discoloration, and this is particularly found on older, mid-canopy leaves during mid-summer but may be found in the upper canopy during later summer when leaves mature. The leaf may start out as a very dark green with a purple or black sheen. This discoloration is not easily visible, but by investigating the canopy mid-summer in addition to stippling will help growers identify a rust mite problem and areas to consider sampling for presence of rust mites. These purplish leaves (Pinot noir) had hundreds to thousands of mites per leaf in mid to late summer. In warmer years or more arid regions, this discoloration will turn to a bronze color (brownish red) later in the season. Bronzing is not always observed in the cool climate regions of Oregon. 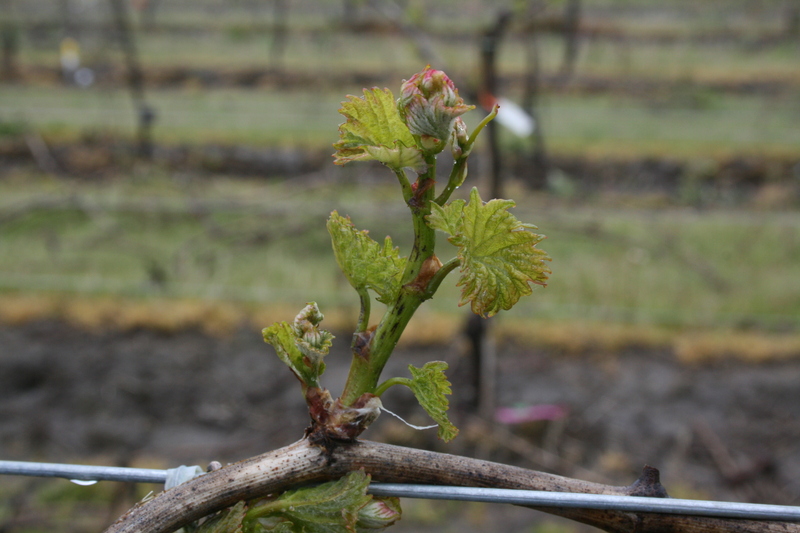 A young Chardonnay shoot in spring has visible scarring on the stem (dark brown-black). Basal leaves are also distorted due to rust mite presence. Pest description and crop damage Grape rust mites are tiny (0.1 to 0.2 mm long) and a have a wormlike shape, much like the bud and erineum mite. They have two pair of legs near the head. These mites are hard to see without magnification (45X or higher under a microscope), and are difficult to distinguish from other eriophyid mite species. The damage they cause to small shoots or leaves is usually the first indication of their presence. Grape rust mites cause damage to newly growing tissues in spring. Shortly after budbreak, rust mite damaged shoots appear stunted and may have significant pubescence-a downy appearance with many plant hairs. Leaves are often crinkled, deformed and cuplike. Scarring may be found on the stem tissues. Rust mites are found mainly on leaves during late spring and early summer, where they cause stippling. Stippling is most often found on the youngest leaves at the shoot tips or on lateral shoots as the season advances. High populations of rust mites on leaf surfaces can occur in mid- to late-summer through early fall. Later season symptoms are visible as purplish or blackish green color which may transition to a bronze (red-brown) color toward harvest. Biology and life history Grape rust mites overwinter as adult females under the bark, in crevices and between the outer bud scales, and they migrate from these areas to developing shoots in early spring. Mites may congregate and feed on young susceptible shoots, then move on to opening foliage where they continue feeding during summer. 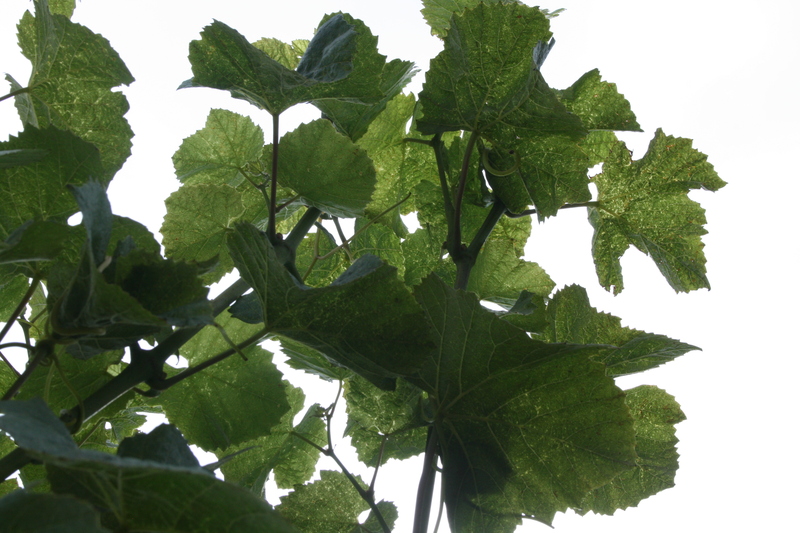 Unlike most other mite species, grape rust mites feed on the top and bottom surfaces of leaves. Feeding on epidermal tissue of leaf surfaces results in stippling of the leaf during spring and summer, and they may cause visual discoloration of leaves that begins as dark-green to black and become a bronze or brown color during later summer when leaf populations are high. Sampling and thresholds Rust mites are difficult to identify on plant tissues because of their microscopic size and translucent color. Presence is determined by examining buds collected during the dormant season under a stereomicroscope with a minimum of 45X magnification. Stems or leaves can be collected and observed for rust mite presence in spring and summer. Scout for grape rust mite populations during summer. Often leaf "bronzing" may start out as a dark green-black or purplish hue on the leaf surface and progresses to a bronze-copper color later in the season. Under high magnification (greater than 45X) worm-like mites can be observed moving on upper leaf surfaces. 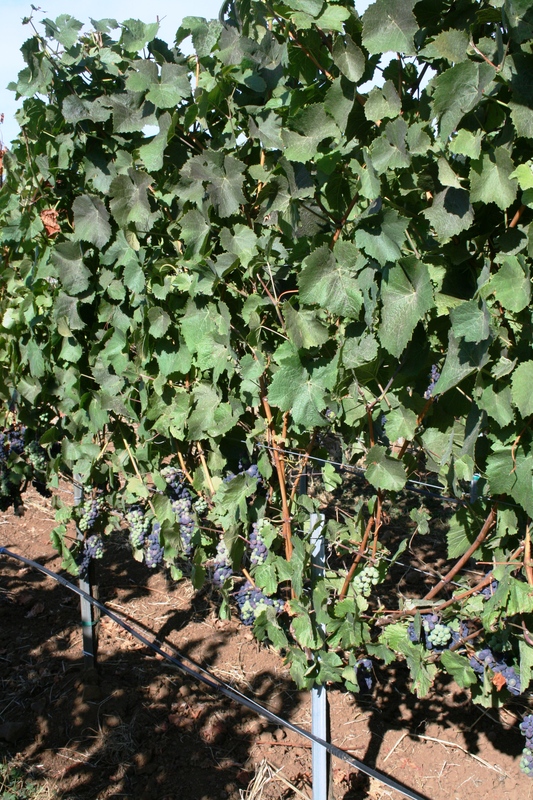 Assess mite density by using a mite washing technique (http://www.extension.org/pages/33107/grape-rust-mite#). Note the presence and location of summer populations. Follow up sampling during the late dormant season, as the majority of mites do not survive winter. Not all infested vineyards will exhibit the leaf discoloration or "bronzing," particularly in healthy, vigorous vineyards of western Oregon. Scouting during the winter involves collecting dormant 1-year old canes to examine buds. Randomly select forty canes from across affected areas in the vineyard. Canes should be cut close to the base of the shoot and should consist of at least 3 buds. Also collect loose bark from the trunk of the vine, focusing on the head of the vine. Place tissues in separate plastic bags and keep refrigerated until inspection. Rust mite numbers pre-season can be determined by observing these buds under magnification, starting by removing the outer bud scales. Rust mites are often found at the base of the bud, directly under the outer bud scale and surrounding areas. To determine if rust mites are on bark tissues, observe under the dissecting scope or place in a plastic bag with a 35% isopropyl alcohol solution, seal and shake briskly for 30 seconds. Decant into a petri dish and observe under a dissecting scope. To learn more about the washing method, view this instructional video (http://youtu.be/9Qe4gJ3y_-s?list=UUBr5ACbEF_9UljHRaT-2iSQ). To read more about grape rust mite, see Grape Rust Mite on eViticulture.org (http://www.extension.org/pages/33107/grape-rust-mite). There are no damage thresholds established at this time. Grape rust mites are subject to predation by a number of natural enemy species, particularly predatory mites. Sparse populations on leaves during spring and summer can be regulated by predatory mites, when predator-friendly chemicals are used in pest and disease management. The presence of grape rust mites during summer, and consequent recruitment of predatory mites, may also enhance biological control of spider mites. For information of the impact of commonly used chemicals on predators, see: OSU Extension publication EM 9095, Evaluating Compatibility of Horticultural Oils and Sulfur with Vineyard IPM (https://catalog.extension.oregonstate.edu/em9095). Dormant-season oils and insecticides used for other pests may control this pest. Sulfur continues to be used by many Oregon growers as an economical way to prevent powdery mildew, and it also is an effective way to control rust mite populations. 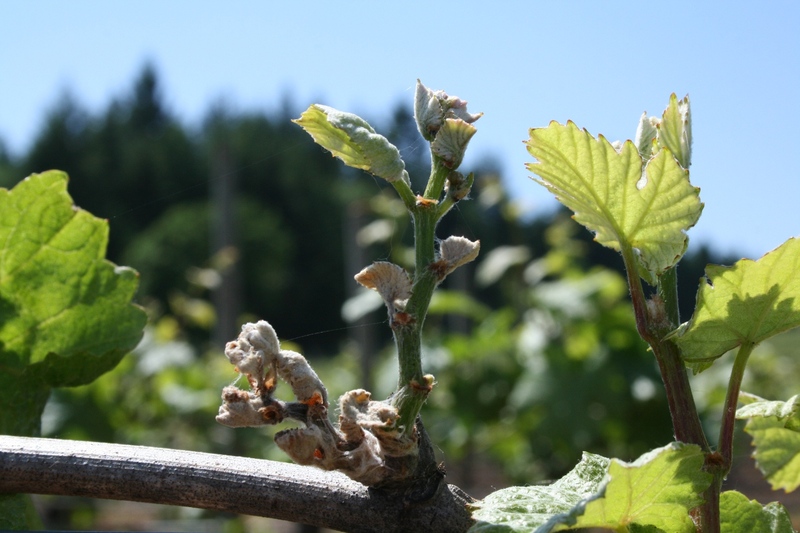 Rust mite presence and damage has been found mainly in young vineyards in western Oregon, in part due to the fact that these vineyards are generally not managed with a full fungicide program during early years of establishment, and this allows pest mite populations to develop. Since there is evidence that rust mites are present on nursery stock, it is important for new vineyards to apply sulfur mid-spring to summer during the first few years to prevent damaging populations from developing and causing tissue damage and delayed canopy development. neem oil (Trilogy and other brands)-Check label for rates. Some formulations are OMRI-listed for organic use. stylet oil at 1 to 2 gal of product per 100 gal water/a. Do not apply sulfur within 10 days of applying oil. Do not apply when temperatures are above 90°F or below 50°F. Stylet oil has limited efficacy in western Oregon in controlling rust mites and use has resulted in increased erineum mite problems in early season. Some formulations are OMRI-listed for organic use. sulfur (Microthiol Disperss, Kumulus DF, or other brands of wettable sulfur) at 3.2 to 4.0 lb ai/a (4 to 5 lb product/100 gal water) applied just before budbreak (at woolly bud stage) or during budbreak. A second spray is recommended between 7-14 days after the first in order to target mites as they emerge on new buds and move on expanding shoots and leaves. High spray volume and timing are critical for targeting mites during migration. Watch grape phenology closely when making these applications and consider the temperatures during early season as Oregon can be cold and have limited efficacy of sulfur if temperatures are below 60ºF. Group M2 product, 7-14 day spray interval, 0 PHI. Most brands are OMRI-approved for organic production. Foliar applications of wettable sulfur have shown efficacy in reducing canopy populations of rust mite mid- to late-summer when populations are high. During late summer/early fall mites begin migrating to overwintering sites and may be protected from sprays. More research is needed in this area to determine the best timing of sprays to control this pest to prevent problems with damage the following spring.